PLANET FGSW-1822VHP is an ideal Plug and Watch Power over Ethernet solution which provides quick installation, real-time PoE work status monitoring and immediate troubleshooting through its unique LCD display to improve work efficiency and quality without any PC or software required. The LCD monitor of the FGSW-1822VHP clearly shows the PoE loading of each port, total PoE power usage and system status, such as overload, low voltage, over voltage and high temperature. With its brand-new LCD monitor, user is able to obtain detailed information about real-time PoE working condition of the FGSW-1822VHP directly. Also the Power Budget Control function helps to prevent power budget overloading. The built-in solid DIP switch provides “Standard” and “VLAN” operation modes. The FGSW-1822VHP operates as a normal IEEE 802.at/af PoE Switch in the “Standard” operation mode. 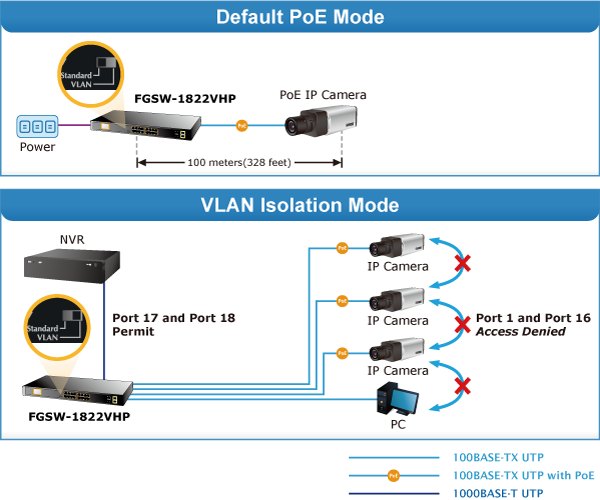 The “VLAN” operation mode features with port-based VLAN function that can help to prevent the IP camera’s multicast or broadcast storm from influencing each other. 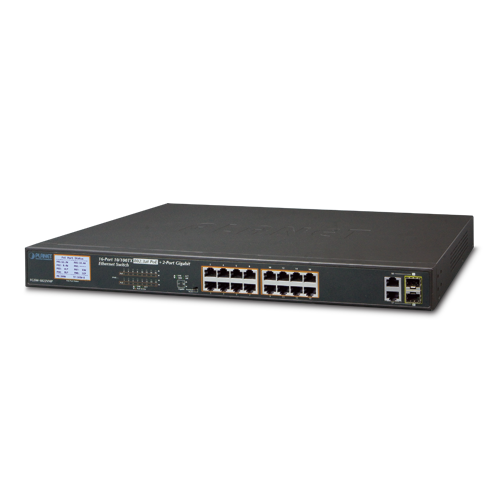 The FGSW-1822VHP provides 2 extra Gigabit TP/SFP combo interfaces supporting 10/100/1000BASE-T RJ45 copper for surveillance network devices such as NVR, video streaming server or NAS to facilitate surveillance management. The FGSW-1822VHP provide contact discharge of ±4KV DC and air discharge of ±6KV DC for Ethernet ESD protection, also supports ±4KV Surge Immunity to improve product stability and protects users’ networks from devastating ESD attacks, making sure the flow of operation does not fluctuate. 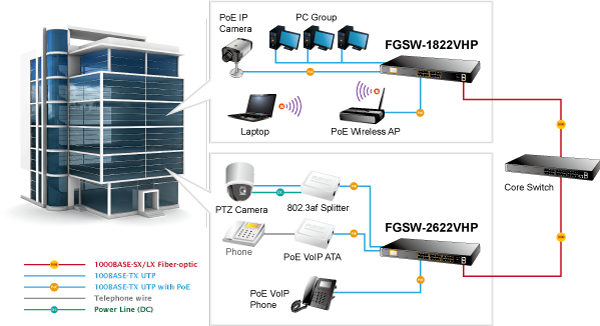 As data transfer and high power PoE are transmitted over a cable, the FGSW-1822VHP is able to reduce the need of extended cables and electrical outlets on the wall, ceiling or any unreachable place. It helps to lower the installation costs and simplify the installation effort. All RJ45 copper interfaces of the FGSW-1822VHP support 10/100Mbps and 10/100/1000Mbps auto-negotiation for optimal speed detection through RJ45 Category 6, 5 or 5e cable. It also supports standard auto-MDI/MDI-X that can detect the type of connection to any Ethernet device without requiring special straight-through or crossover cables. 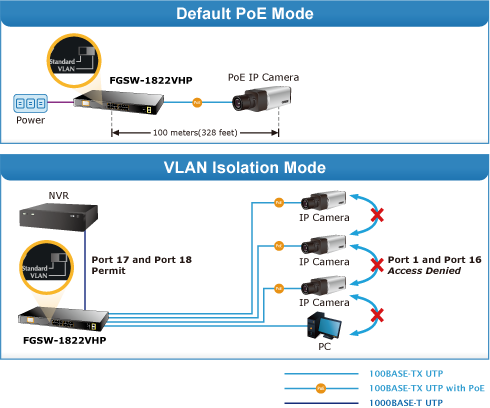 To fulfill the needs of the high power consumption of PoE network applications, the FGSW-1822VHP provides sixteen IEEE 802.3at Power over Ethernet Plus (PoE+) ports that combine up to 30 watts of power output and data per port over one Cat5E/6 Ethernet cable. With its 7.2Gbps high-performance switch architecture and 300-watt PoE power budget, the FGSW-1822VHP is an ideal device for catering to a medium-scale IP surveillance or public PoE networks at a lower total cost. 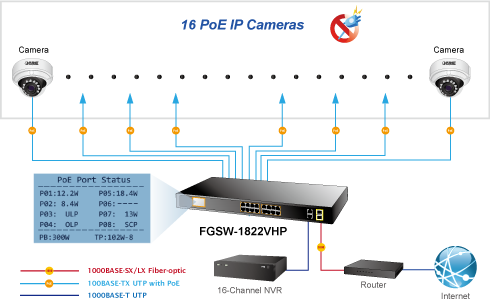 For instance, one FGSW-1822VHP can be combined with one 16-channel NVR and 16 PoE IP cameras as a kit for the administrators to centrally and efficiently manage the surveillance system in the local LAN and the remote site via Internet. 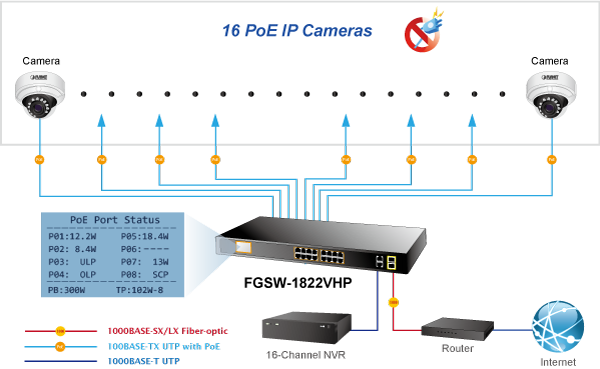 The recorded video files from the 16 PoE IP cameras powered by the FGSW-1822VHP can be saved in the 16-channel NVR systems or surveillance software to perform comprehensive security monitoring. Providing sixteen 802.3at PoE+ in-line power interfaces, the FGSW-1822VHP can easily build a power that centrally controls IP phone system, IP camera system and wireless AP group for enterprises. Cameras can be installed around the corner in the company or campus for surveillance demands. Without the power-socket limitation, the FGSW-1822VHP makes the installation of cameras more easily and efficiently.